In the far north of Sweden, there is a river called Torne that runs crystal clear in the summer time. The flowing water in the summer turns to rock solid ice in the winter, and is then shaped into everything from ice glasses to ice beds. On the river bank, is a town called Jukkasjarvi, and there, the brilliant Ice Hotel is built every year. Land around the hotel turns from frozen solid to a flowing river and back again every year, meaning that the luxurious Ice Hotel can only be enjoyed to its fullest for the four months that it is standing. The hotel is crafted with such design and precision, that it is many artists’ dreams to be chosen to work on the Ice Hotel. Each room is a showcase for high class art and design, and every artist wants to be a part of it. Around 250 applications are received every year to work on the design team for this unique hotel. 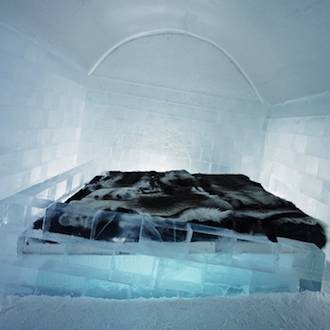 Each bed is surrounded by artwork made of ice, snow, and “snice” (the perfect blend of ice and snow). 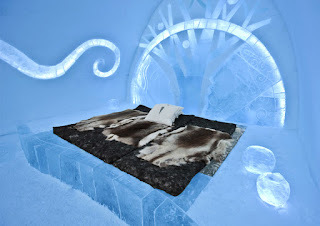 Each person sleeps in a thermal sleeping bag, and lay on a bed of ice blocks, and a mattress topped with reindeer skin. Even though it might be -30 degrees Celsius outside of the hotel, inside the walls, it never gets below -5 to -8 degrees Celsius. 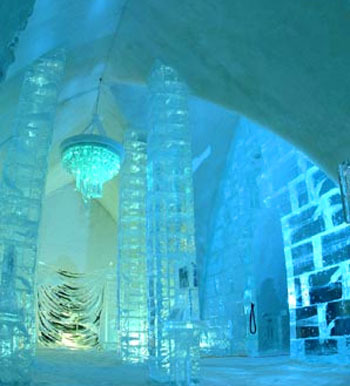 There is even a summer version of this resort, which has a smaller piece of the ice hotel, with an ice bar and a place to try ice sculpting! The elegant precision with which this was sculpted is what makes the experience so incredible. For more information on booking a stay with the Ice Hotel, Sweden, visit www.icehotel.com. Prepare for the arrival of Royalty! Prince William and Kate Middleton are about to become parents in July, and the finishing touches to the royal nursery are no doubt underway. But who is the one doing the design? Mum is the word, but if tradition follows, Dragons of Walton Street could be the chosen decorator. 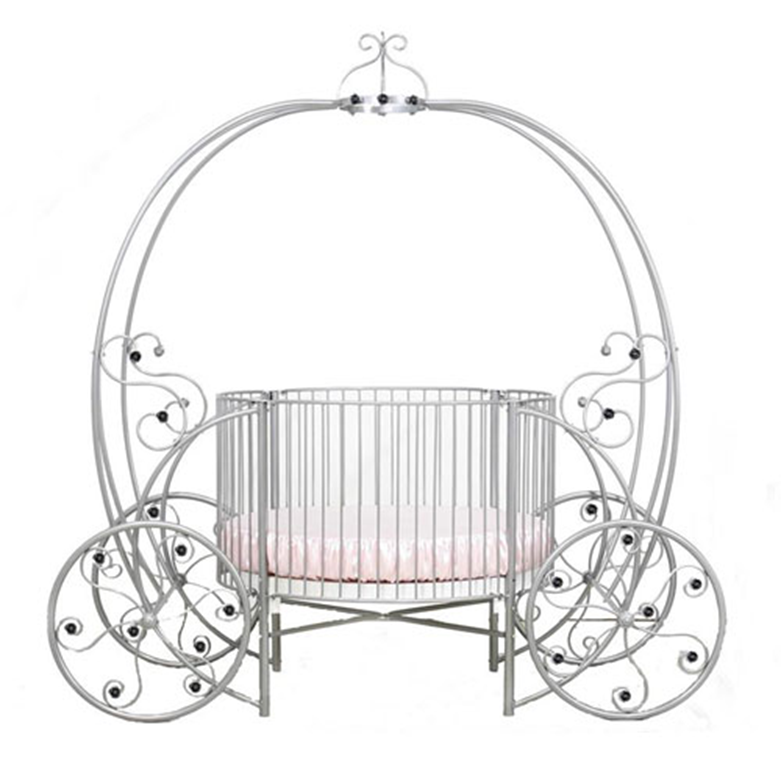 Dragons of Walton Street, a firm specializing in hand painted furniture is one of London’s leading design firms. 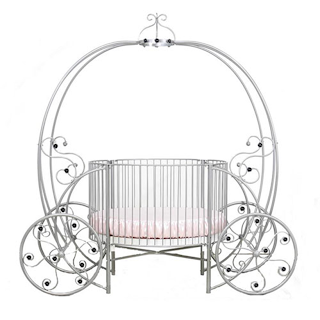 In the 1980’s, Dragons was the choice for Princess Diana when planning custom nurseries for Princes William and Harry. Princesses Beatrice and Eugenie also had their nurseries designed by the firm. Other clients include Gwyneth Paltrow, Victoria Beckham and Madonna. Dragons will not discuss their clients, except for one. 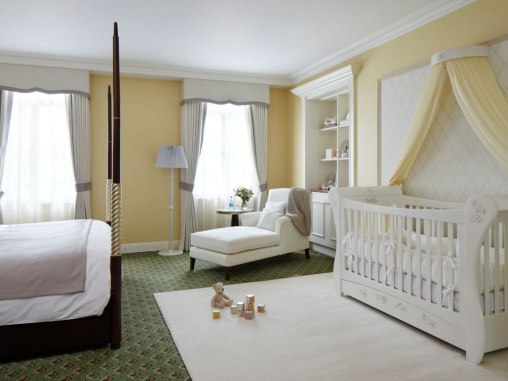 Dragons has just completed the design of a royal nursery suite at London’s famous Grosvenor House. One must marvel at the timing! This royal nursery is dreamy. Decorated in calming, soft ivory hues, it features a sculpted scroll-top cot-bed, with a regal coronet and sheer voile curtains neatly draped on either side. The two-armed chaise lounge chair is perfect for new moms. The suite is quite large and impressive. It has a lovely changing area all done in a hand painted Beatrix Potter theme as well as a play area featuring child size furniture. Children will delight having tea on a beautifully hand painted table depicting London landmarks as they look out the window to Hyde Park. There is also an amazingly detailed doll house that is a miniature replica of the Grosvenor House. This brilliant suite is not available until June, but reservations are now being accepted. Grosvenor House is a five star J.W. Marriott Hotel. There’s one artist in New Zealand who gives new meaning to “adding a room.” Graham Fletcher’s art is a little of that, and a whole lot more. Lounge Room Tribalism is a series of oil paintings by Fletcher who is of Samoan and European heritage. Fletcher’s work explores the legacy of the widespread European tradition of housing collections of tribal art in domestic settings. The detail, including the flooring in his work is astonishing. 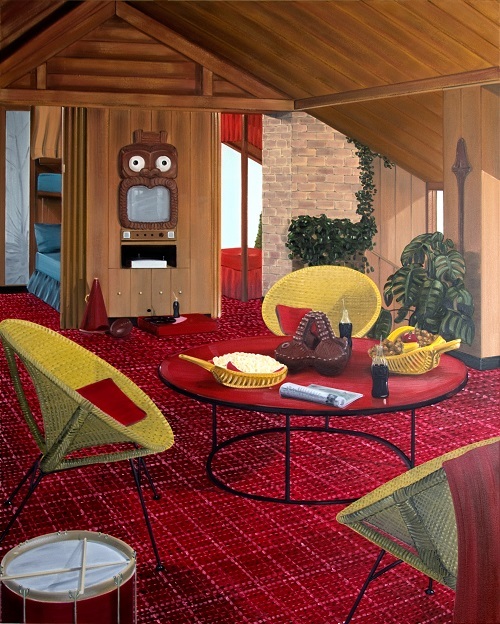 As you see in this painting, the tribal artifacts challenge the ordinary living space of a modern home in the 1960’s. The wall hanging is not only out of context but its ‘heritage’ plays games in the setting of a 1960’s modern home. If the artifacts were to be removed, what would be left? 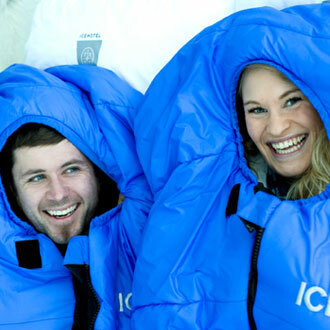 IDG spoke recently with Fletcher. IDG: Is your work in the states? GF: I haven’t yet explored gallery representation in the States but I have been involved in a couple of State side shows recently. The first was in 2011 at the Red Mill Gallery, Vermont and the following year I exhibited in a group show entitled ATA at the Harris Gallery of the University of La Verne, California. IDG: What interior designers are promoting your work? GF: I don’t know which local interior designers are actively promoting my work, but my art dealer Melanie Roger has a network of designers and architects that are very supportive of my work. One commission I took on a few years ago was to supply a number of artworks to a newly built Hilton Hotel located on central Auckland’s waterfront. It was an enjoyable experience and nice to see my work in such plush surroundings. GF: I enjoy making these works on a large scale which coincidentally may take on the proportions of a window. 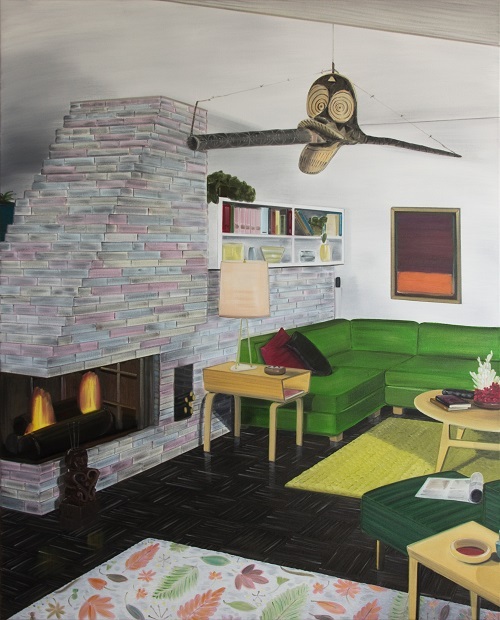 A collector of one of the Lounge Room Tribalism works once told me that sometimes, out of the corner of her eye, her lounge room painting gives the illusion of an adjoining room – another space. Although my intention was never to create a trompe l'oeil effect, the idea of an optical, illusionary space is interesting to me. GF: I’m currently working on a new body of work to be exhibited at Melanie Roger Gallery (Auckland) in July 2013. The show is entitled Sugar Loaf Waka and represents a slight shift away from previous ‘Lounge Room Tribalism’ works. Tribal objects are still strategically placed within Modernist interiors, but these objects now function with new roles that force them to integrate more with their new environments (as well as be further alienated from their historical function). The Sugar Loaf Waka, is one of many pyramids in the Rimac Valley of Peru, and is thought to be the oldest of the pre-Inca monuments. Within these Wakas can be found funerary chambers that contain mummified corpses often surrounded by a range of objects such as earthenware pots and wooden oars. This notion of preservation is central to the ideas behind the Sugar Loaf Waka works, to the point where these idealized spaces become time capsules where meaning is altered through the passage of time. 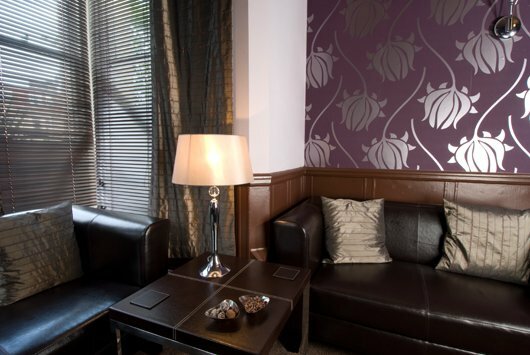 If you or someone you know loves chocolate, there’s no better place in the world than the Chocolate Boutique Hotel in Bournemouth, England. Just one hundred and five miles southeast of London, the hotel is situated in West Cliff, Bournemouth, on the southern coast of Dorset County, England. This adorable boutique is beautifully decorated in a ‘chocolate theme’ and is truly a chocolate lovers dream come true. 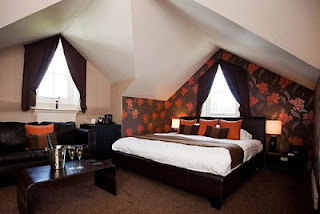 The Chocolate Boutique Hotel offers all kinds of accommodations from a simple one night stay, to corporate team building weekends, to weddings and even slumber parties (the ultimate ‘girls night out’). 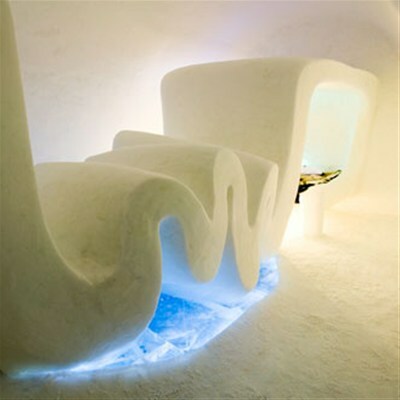 There are 13 cocoa-themed rooms (one being a ‘white chocolate room‘), with chocolate fountains, cocktails, (in the cozy chocolate bar) and a slab of chocolate by each bed with a personal handwritten message (in chocolate) for your loved one. A typical stay at the hotel involves checking out the kitchen and taking part in a chocolate cooking workshop though this is entirely optional. These hands on courses range from two hour classes to two day intense chocolate immersion classes geared to people who may want to start their own chocolate business. One of the ways hotel owner and chocolatier Gerry Wilton uses to get students to relax is to have them paint a portrait using dark, white and milk chocolate. 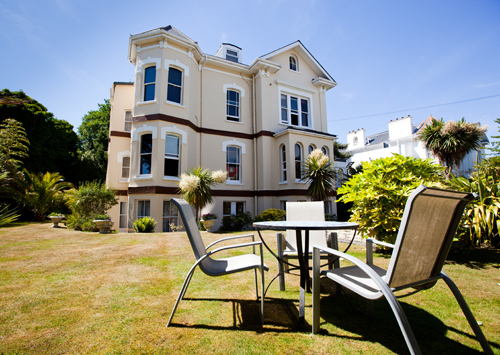 The Chocolate Boutique Hotel has been named one of the top six novelty hotels in the world by The Sunday Times Travel Magazine. 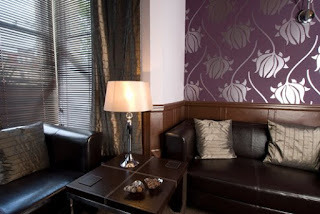 For more information, or for interior design inspiration visit: www.thechocolateboutiquehotel.co.uk.